Vitamin A (Beta-Carotene 6400 mcg/day) is required for clear vision, healthy skin and immunity for both you and your baby. Excessive vitamin A can however lead to toxicity and can be harmful. It is usually not necessary to supplement your diet with any other form of vitamin A (e.g. in tablet form). If you consume the following natural food sources mentioned below. 3. Dark green leafy vegetables Spinach (Palak), Mint, Fenugreek, Kale etc. 4. Animal Sources Milk, curds, paneer, cheese and eggs. Hara Bhara Kebab is a healthy vegetarian version of kebabs with a tasty blend of ingredients. The spinach adds to its vitamin a content while contributing very little to the carbohydrate levels. The green peas add bulk and fibre to this dish. Have this filling Carrot Cucumber and Rajma Salad in Mint Dressing loaded with vitamin A from carrot and mint together with protein rich rajma too. This salad also provides excellent nourishment for your eyes and eye muscles. When craving for something sweet during snack time then try this Stuffed Carrot Halwa Pancake that is healthier and will also leave you satisfied. Loaded with essential nutrients and satiating too, these halwa packed and cinnamon laced whole wheat flour pancakes are ideal for pregnant women. Paneer Palak Koftas in Makhani Gravy is an innovative recipe as it uses red pumpkin and low-fat milk to impart a creamy and thick mouth-feel, without using any butter or cream. The koftas are also steamed instead of deep-fried. Carrot Methi Subzi gives a great boost of vitamin A to your body as carrots are one of the richest sources of carotenoids and fenugreek too is high in antioxidants, vitamin A and C. Tamatar ki Kadhi provides you antioxidants like vitamin A, vitamin C and lycopene that fights against free radicals and improves your immunity, keeping you hale and healthy during this happy and memorable period of your life. 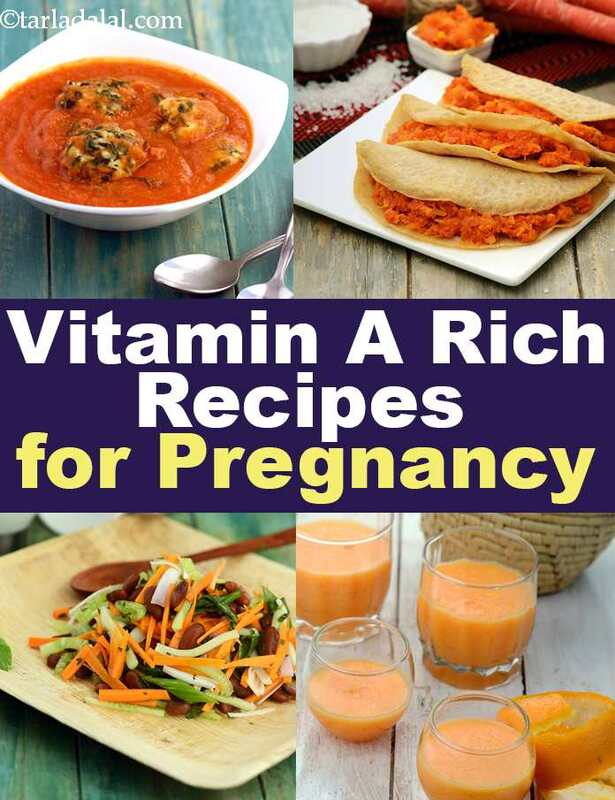 Enjoy all our vitamin A rich recipes for pregnancy. Explore more varieties in our pregnancy section everyday.